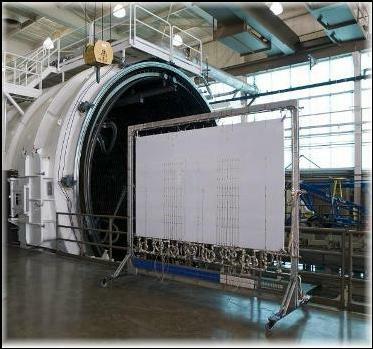 · November 2008: MII successfully completes an Air Force Phase I SBIR for demonstration of novel thin EMI coatings for composite and plastic enclosures. Novel design and processing showed EMI shielding effectiveness far greater than 70 db on coating thicknesses of 0.0015” when on a thin Kapton film. Cost was shown to be extremely competitive. · October 2008: MII successfully releases an internally designed UHP (60 ksi) waterjet pump technology to its sister company that allows AWC to increase the reliability of its waterjet pumps to >1500 hours between overhauls. This is a technology and performance enabler for increasing AWC’s competitive position in these very tight economic times. Industry standard time between pump rebuilds is less than half of that time. · May 2008: MII’s Coollok retainer passes all provisional Patent Checks and is authorized for US Patent #. Trademark Awarded. Final Patent authorization pending international Patent Apps. · March 2008: MII successfully completes an Air Force Phase I SBIR for demonstration of an all composite heat exchanger for Jet Fuel to Air. The unit is entirely graphite composite. Laboratory simulation confirmed no leaks at 150PSI with 500 Watts heat rejection from a 9 cu inch core at atmospheric pressure and modest fuel flow rates. · November 2007: MII significantly upgrades its facility and increases its manufacturing base to 12,000 square feet. Left: Second generation Radiator Demonstration Unit (RDU) designed and built by MII. The background shows the thermal vacuum chamber at NASA GRC where the unit will undergo testing. Lower: The notional view/model of the Lunar FSP platform with 12 separate radiators. The unit is composed of structural composites, thermally conductive composites, graphitic foam, thin walled titanium plumbing, titanium based heat pipes, and a white hi-emissivity coating. 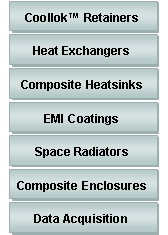 Sub contractor support for thermal optimization and heatpipe fabrication are Materials Research & Design (MR&D) and Thermacore respectively. The unit weighs only 87 pounds (minus the dolly frame) and dissipates >6000 Watts with less than 12 psi pressure drop in the plumbing circuit for the conditions under which it will operate.